Probably due to the interest, “or should I say lack-of” compared to the warm weather walleye seasons. Let’s face it, not everybody heeds the call to go fishing when the mercury dips below the freezing mark. These facts, along with other winter fishing variables and hazards have historically kept the hoards of warm weather fishermen off the lake when the water hardens. But recent technologies, equipment changes and improvements have made it a lot safer and easier to both seek and find thee elusive Wall-a-gator under the ice. Of course, knowing the how, when and where to apply these new tools, is the secret that will put the odds for success in your favor. Unlike the guy who heads out with spud in hand using it almost as a divining rod, hoping to stumble onto a fish catching hotspot. 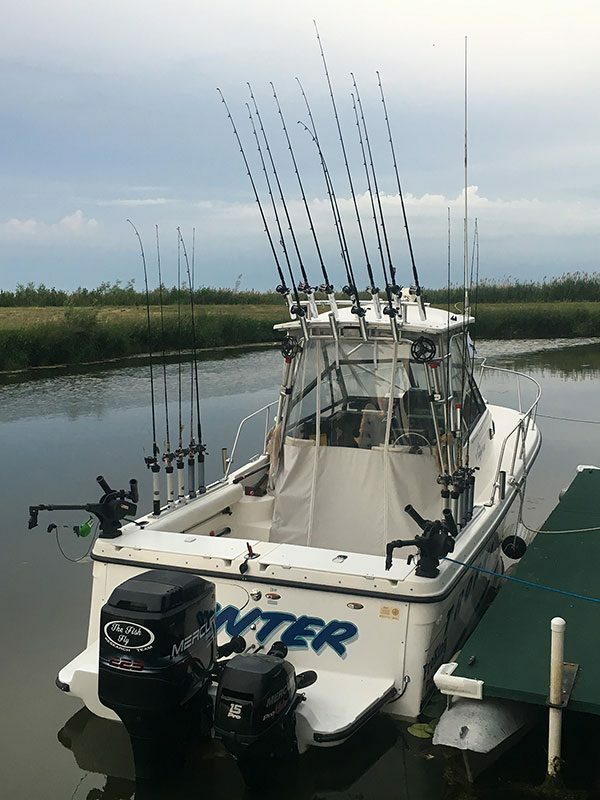 The modern day ice fisherman has the ability to transport more and modern equipment. He can mark and locate structure, points, fish and the exact water depth along with more details on the featureless frozen expanses than his later day brethren ever did. Let’s explore some of the old as well as the new tools, their uses, advantages and the proper way to use them when it comes to catching any under the ice species. Back when I was a young lad (late 50’s/early 60’s) I remember driving out on the ice with my dad most often in the family car. Sometimes, some 6 to 7 miles out, depending on where the well worn trail was as well as the fishing action. And before those days you simply toughed it out and walked or took the horse or truck drawn sleigh or taxi out from the few hotels, marinas or bait shops that offered this service. And most often a spud or axe was used to cut a hole once you arrived, as augers, especially the motor driven type, were very rare or to expensive to own. And there probably were some topographic maps of the Lake of Bay in existence, but not in stores or outlets where Joe-Blow fisherman could readily get a hold of them. Now, with vehicles being in the 20 to 30 thousand dollar price range, and insurance companies warning that once you drive out on the ice your coverage is nil. Not to mention the fines you’ll face from the DNR if your truck or car takes the big Dive. That old time thrill of simply driving off the end of the road and heading out to the fishing grounds has lost a lot of its charm. Snowmobiles came into vogue around the late 60’s and opened up a whole new form of transportation that allowed you to go virtually anywhere when the ice was safe enough to travel on. The fishing equipment used back then was basic. And the only way you knew if you were in the right spot, was to actually catch some fish. Or fish in water shallow enough, to actually see if any fish were even looking at your offerings. Another of the things I remember best from that earlier era was the cloths I wore. Dad had bought me a set of World War II Bomber Bib coveralls and coat from the local Army Surplus Store. These were teamed with the old style 4 buckle rubber boots that were worn over your shoes. A far cry from the Cabela’s severe wear, with 1000 thermal denier pack boots of today. "Modern Gizmos and their uses"
With the top-of-the-line modern snowmobiles and 4 wheelers both costing about $3,000 more than I paid for my first new pickup truck back in 1974, transportation has become quit expensive, yet refined and advanced. These four wheel drive (Mini Jeeps) and (Super Sleds) can dig, cut or power their way through almost anything the winter elements can throw at them. The payload and power these (winter busters) can handle is awesome. My own 250 Yamaha 2 wheel drive (equipped with chains) hauls me, my dog sled with 2 passengers and my 4 man Otter Skin shanty, auger and gear without a whimper. And speaking of augers, I know my Grandpa would have been in awe seeing as many as six 10″ ice holes cut and clean in as many minutes. This handy little tool also makes it a lot easier when you decide to move and find other likely spots, knowing that it won’t take all day and get you all sweated up while doing so. He would also be impressed with both the electric igniter and the propane heater I use, to keep the shanty in that 60-plus degree comfort zone, versus setting outside in the elements on a 6 gallon pail all day. And wouldn’t he flip watching my Vexilar FL-8 light up and being able to see not only the approaching fish, but every move his jigging lure is making. And just heading out and letting lady luck or the local fishing pack dictate where you decide to fish, is also a thing of the past. Latitude, Longitude and Global Positioning Satellites have made lady luck only a partial player in the success equation. As a modern day GPS, with the help of that particular Lake or Bay Loran navigation map, can take you to that exact hump in deep water, ledge, point or drop off. And if you do find that sweet spot, it can take you right back to the same holes the next day, even if a fresh snow covers your trail. 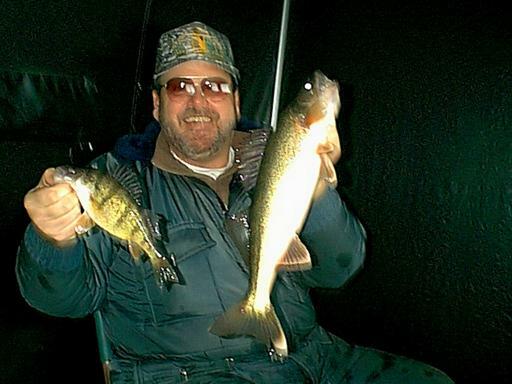 Often times while ice fishing, (especially walleyes), why you’re catching fish in a certain spot can be baffling. I’ve often had my best luck in deep featureless expanses, where the nearest structure, drop off or ledge is almost a mile away. 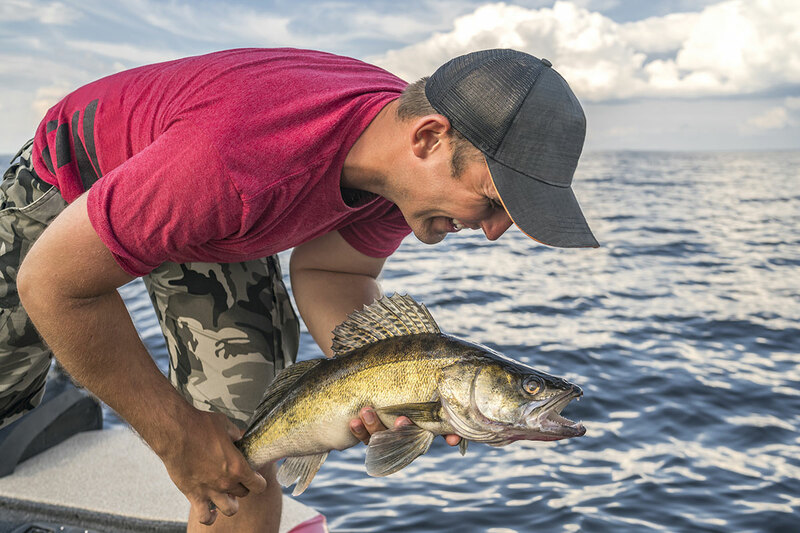 The walleyes built in instinct to continually roam and forage is always working. And I often think they have unseen or subtle little depressions they fallow along the bottom while foraging. Hitting these spots and staying on them is often imperative, and these modern tools make it a lot easier than in the old days. I guess the modern day rods, reels, lures and the many different kinds of lines have also had an impact. But in a much smaller capacity than the other modern gizmos mentioned. And getting outfitted with all the above mentioned gear would indeed be a huge investment. But the trade off is clear. Your chances for ice fishing success are more than doubled compared to the old days…. I suppose I could rattle off a hundred different lure choices along with the ways and places to use them. But each body of water you’ll ice fish, seems to have its own favorite motis-oper-endi. 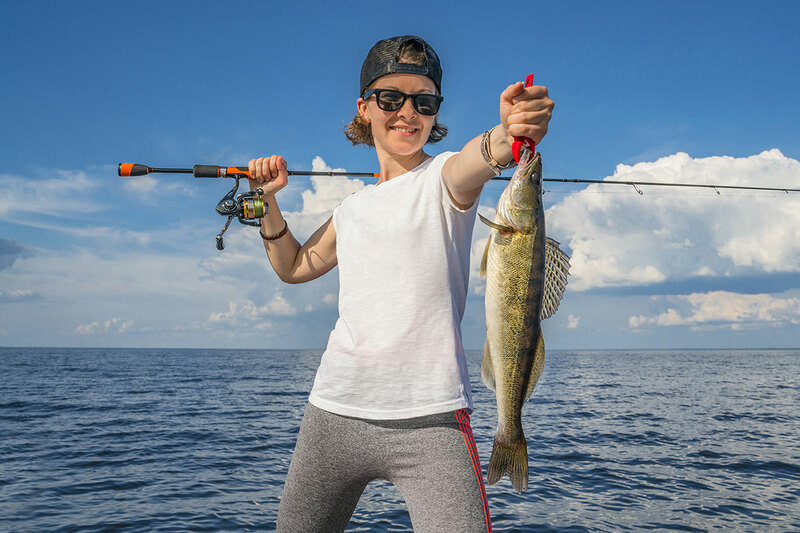 Variables like lure choices, colors, and techniques when using them, along with bait types, colors and sizes can also make a big difference on the many different bodies of water you’ll fish. And all the things mentioned so far are actually just mentioned so far are actually just helpful tools and only a means to an end. That end being, attracting and catching fish in an extremely cold underwater environment. Compound this by the fact that you’ll also be pretty much stationary all day or at least fish only a couple spots. So having the tools that get and keep you as close to the willing biters as possible, as well as the ability to locate these favorite feeding or travel routes again, is imperative. 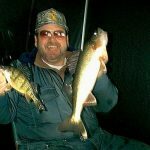 My own native ice fishing grounds is on Saginaw Bay. 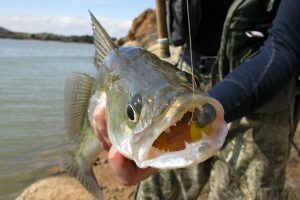 So, I know all the old time favorite spots and have become a lot better at locating and choosing the lures that seem to appeal to Ol Marble Eyes, both on the Bay and in its river tributaries. And having a good Loran Map (Paper or CD) and GPS, has been my most used and helpful tools in the last 10 years. As mentioned above, often flat, featureless areas have become some of my favorite spots on the Bay. But after the trip is over, I always figure out just where on the Bay I was fishing, especially if I had good luck. I do this at home on my computer, by using my Lat/Lon coordinates from my GPS, in conjunction with my CD loran map of the Bay. Many times, clues as to why I’m catching fish in these certain spots comes to light because of these tools. It may be a deep water hump nearby I was unaware of. Or a slight bottom contour or shelf that just may funnel these winter nomads in my direction. 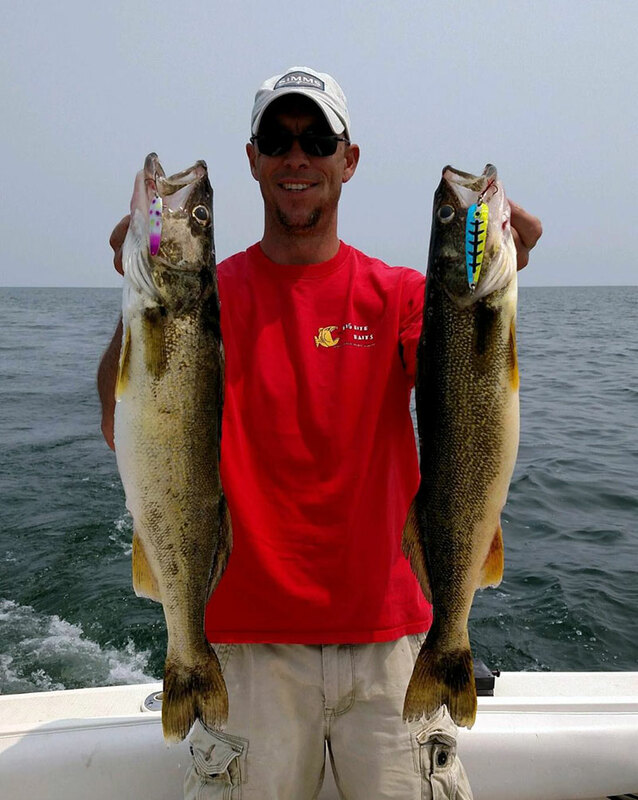 Now, if I had to give an all time tip on technique when fishing Saginaw Bay, it would be stay close to the bottom. Six inches off bottom is as far up as I fish any kind of baits or lures. This applies to both the Bay and the Rivers. I usually use one rod to jig with and the other hovers next to it with a live bait presentation. My favorite lure to jig with is a Do-Jigger Spoon, made by the same people in Michigan’s Upper Peninsula who make the Swedish Pimple. Silver and Blue is my first color choice. I pinch a large Blue Shiner in half and the head part is placed on one hook. The other rod usually sports a Gens Worm (Yellow/Chartreuse) with a Blue Shiner hooked slightly so it stays alive and active, between the dorsal and tail fin. One is jigged, the other left hanging in that 2 to 6 inch from the bottom zone I mentioned. The live bait seems to produce most often during the morning hours, and then the spoon as the day wears on. Hands down, a jigging Rapala, Gold/Orange is the lure of choice on the river. 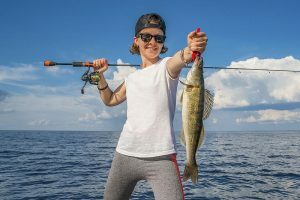 I change the small hook on the belly to a bigger size for more bite when a fish does hit. I also hook a whole small minnow through the head on one of the hooks. Small, sharp rips upward, then let it settle and wait, is the best action for success on the river. Well, there you have it. Hope I covered most or all of the old ways and the modern day improvements, as well as some hints for your next ice trip. Good luck and above all be safe.